The newspapers have this colder than average week billed as a “polar plume”. Cold air cannot really be said to “plume” like warm air (spanish plume). Nevertheless, it is certainly cold up North with settling snow over the hills and wintry precipitation elsewhere too. The GFS ensemble (several model runs combined at once) chart below shows that the colder than average (upper air) temperatures will last until the weekend at least. Thereafter temperatures rise but note the rainfall spikes indicating unsettled conditions. For us here in the sheltered SE it is just cooler than average with patchy overnight frost and bright days with light showers Tuesday pm. A blustery cold front on Wednesday is likely to bring more purposeful rain for a while, as could further active fronts on Thursday when the trough axis moves through our region accompanied by the jetstream nearby to the south. Friday is likely to see a transient high pressure ridge bringing settled weather and then a change in wind direction by the weekend. The overall cool set-up is due to “northern blocking” which is when pressure builds over Greenland and the Pole and the, previously strong, Azores HIGH slackens off and nudges south. At the same time the usual Icelandic low pressure weakens or is dominated entirely by a HIGH pressure (see chart below). In this situation the jetstream works its way south of the UK. The result is that cold polar air is able to leak south out of the polar regions and into the mid latitudes. 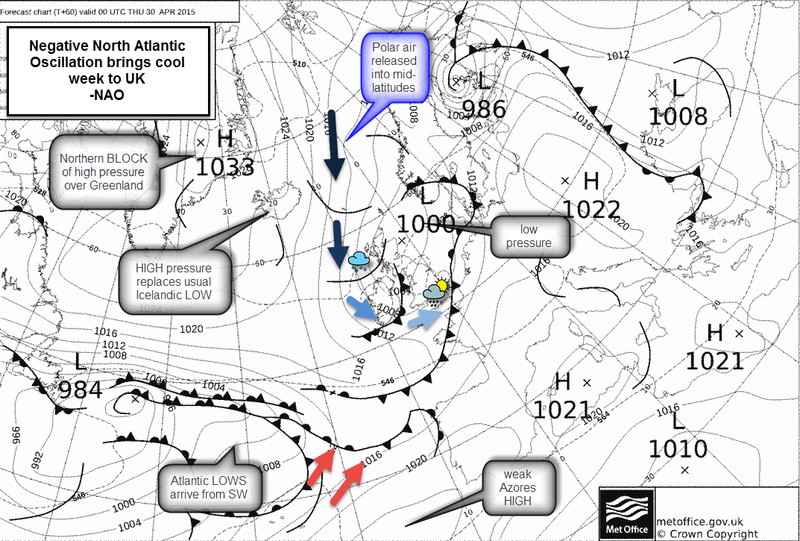 The index shown above summarizes the overall pressure pattern in the Atlantic. It is called the North Atlantic Oscillation. The NAO measures the pressure difference between Iceland and the Azores. 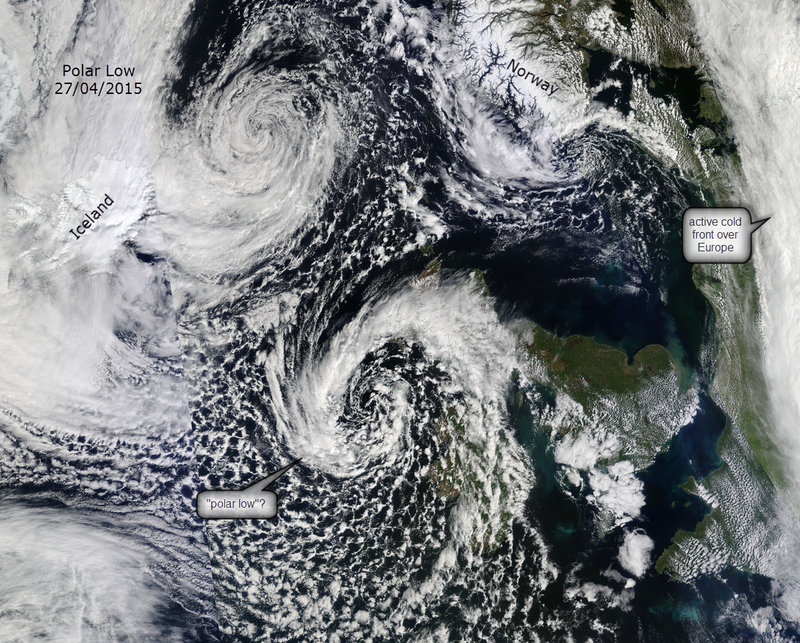 It has been mostly positive this winter: meaning that pressure is LOW over Iceland and HIGH over the Azores. Typically a positive NAO indicates a strong zonal jetstream and mild often wet conditions for Europe with relatively fast moving LOWS passing through. The chart below shows how the NAO has gone negative recently and this indicates that pressure has built over the Pole, creating a blocking situation. The charts above show theta-e temperature which shows cool airmasses over the UK clearly. 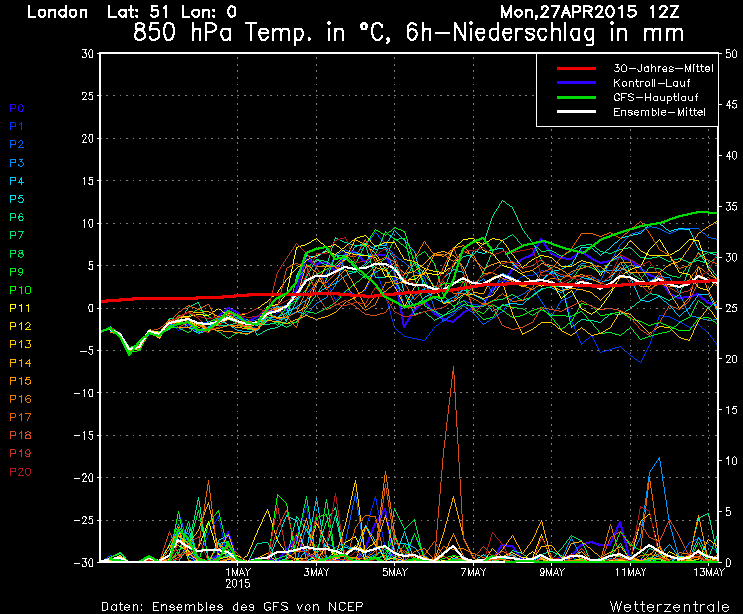 These are 850hPa temperature charts which represent temperatures at 1500m (1.5km) above the “boundary layer”. This height is used to avoid disruptive temperature changes which occur nearer the surface caused by day and night, mountains and water bodies etc that upset the overall temperature pattern for analysis. 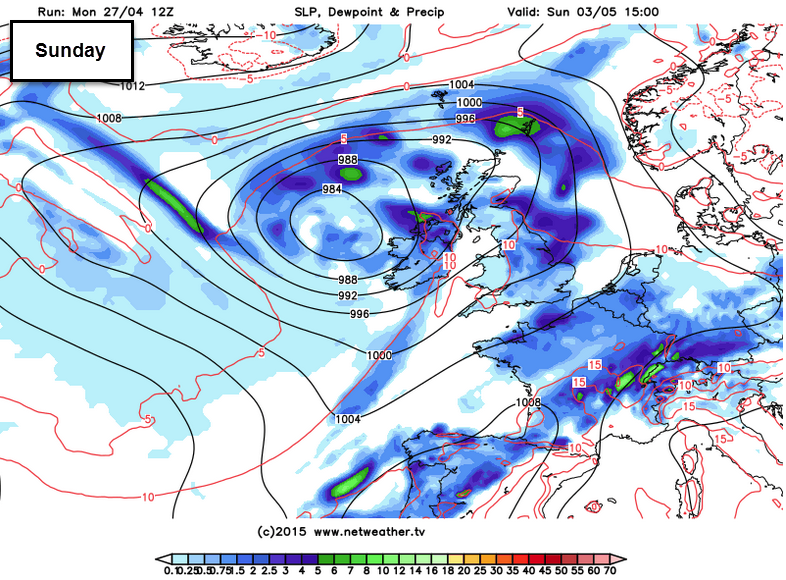 The situation shown below by this weekend is quite different, though still unsettled. Note the warmer flow from the SW.
After the transient ridge on Friday it looks like pressure will fall into the bank holiday weekend as a low pressure nudges in from the Atlantic. The milder humid air brought from the SW by the Atlantic low could potentially cause some significant rain at times around the weekend and into early next week as this meets cold air over the country. Despite the milder upper air arriving from the SW, it is unlikely the “milder” temperatures will be noticeable in such wetter and windier conditions. In winter this set-up could have brought big snow events but in early May it will simply bring rain. For the detail on timing and amount of weekend rainfall we will have to wait and see, but it certainly looks potentially quite wet, though models suggest pressure building briefly thereafter.